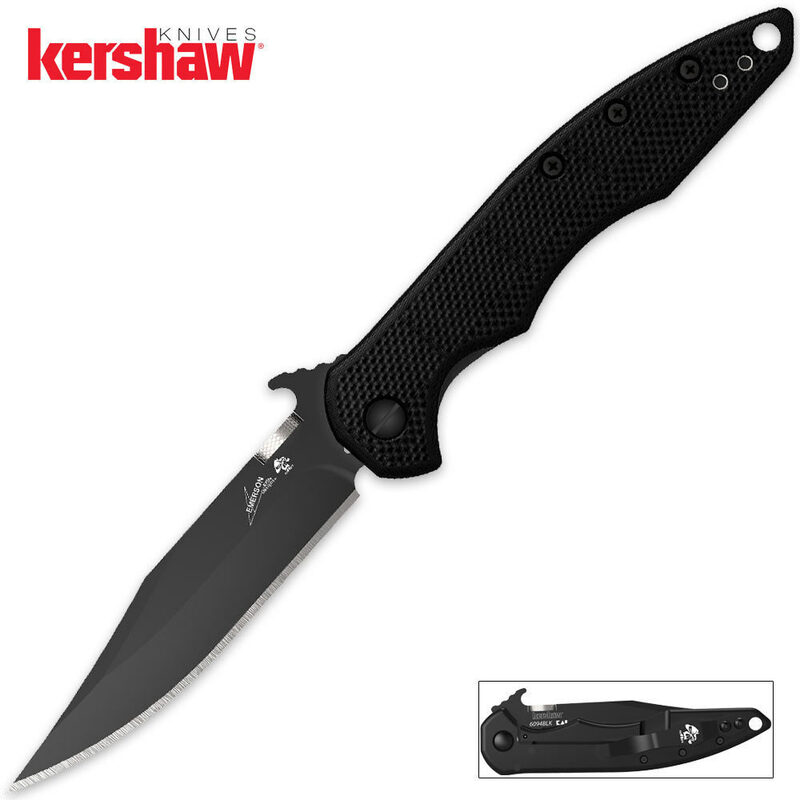 Kershaw Emerson CQC-1K Pocket Knife Slim | BUDK.com - Knives & Swords At The Lowest Prices! The Emerson CQC-1K from Kershaw is one of the most exciting new designs on the market. This great design is a collaboration between Kershaw and Emerson Knives bringing Emerson's patented wave-shaped blade opening feature to a production knife. This opening feature enables the knife to be opened as it is removed from the pocket. By the time the knife has been fully withdrawn from the pocket, the blade is deployed and ready for use. The tab on the top of the blade is built to catch on the pocket seam, opening the knife as it comes out of the pocket. A black-oxide coated 8Cr13MoV stainless steel blade opens securely with the same sturdy frame lock as Emerson's premium models. Each knife includes a reversible pocket clip etched with the Emerson skull logo. This knife is very small. Make sure you read the measurements if you are wanting a medium size knife for EDC. The thumb stud is loose and cannot be tightened. The pocket clip screw are so tight that they stripped at the Phillip head slots. Very disappointed.